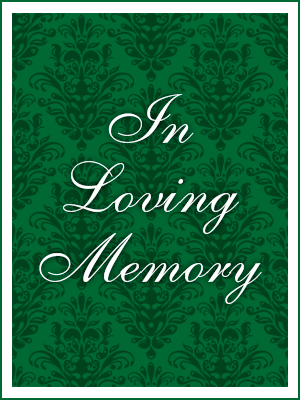 Sandra E. Olsen nee (Balewitz) passed away on March 22, 2017 at home. Born on August 9, 1941 to the late Eleanor & Stanley Balewitz, she was raised in Perth Amboy, NJ. Sandra met her late husband, Emil in 1960 and were married for 53 years. She worked for SI Saving Bank at several locations for over 20 years. She enjoyed baking, knitting and crafting. Sandra was also very proud of her Polish heritage. She is survived by her loving son, William (Bill) & Antoinette Olsen; her adoring 3 grandchildren, 2 brothers, Michael & Stanley Balewitz. Sandra was predeceased in death by her brother, George Balewitz. In lieu of flowers please donate in Sandra’s memory to any charity of your choice. A service will be held Tuesday at Cherubini McInerney Funeral Home at 11:00 a.m. followed by a private cremation. Friends are invited to call on Monday from 3 to 5pm and from 7 to 9pm at Cherubini-McInerney Funeral Home, 1289 Forest Avenue (formerly Meislohn- Silvie).